This is the story of the sarcastic, enthusiastic, often exasperated online community that surrounds the Seahawks on social media, and how that fervent Twitter following came to be. The story of Seahawks Twitter starts with an unsolved mystery. Around the same time Russell Wilson arrived in Seattle and started slinging touchdowns in 2012, Twitter took off. The social media platform’s cosmic growth coincided with the Seahawks’ rapid rise. As Twitter kept growing, and the Seahawks kept winning, an inferno of analytics, inside jokes, memes and Pete Carroll clichés swept onto social media. An unabashedly odd online community began to develop its collective identity. And, along with an intimate militia of writers, fans and bloggers, an account called @BestGuyAround emerged to fan the flames. @BestGuyAround was quirky, funny and more than a little internet-y. He produced the definitive flow chart that attempted, once and for all, to determine who was responsible for the Seahawks’ meteoric rise. Wilson, he claimed, was only good because of Marshawn Lynch, who in turn was only good because of Wilson. Richard Sherman and Kam Chancellor were only good because of Earl Thomas, who was only good because of — you guessed it — Richard Sherman and Kam Chancellor. The entire Seahawks secondary was only good because of Michael Bennett, who — of course — was only good because of Cliff Avril. The arrows pointed everywhere. Each answer was accompanied by another question. Just like in “True Detective,” time was a flat circle. It was entirely irrational, and that was the point. hello friends – It needed to be recreated but….. Think about it like an avalanche, which is made up of a million single snowflakes. Likewise, it took more than one creative voice to set the tone for Seahawks Twitter. But some voices were louder than others. And in the infancy of Seahawks Twitter, @BestGuyAround was exactly that. Until, of course, he wasn’t. In the summer of 2016, @BestGuyAround abruptly abandoned social media. He took his flow charts, memes and thousands of archived tweets with him. Besides a black avatar, two tweets and 35 followers, he effectively scrubbed all evidence of his presence off the web. 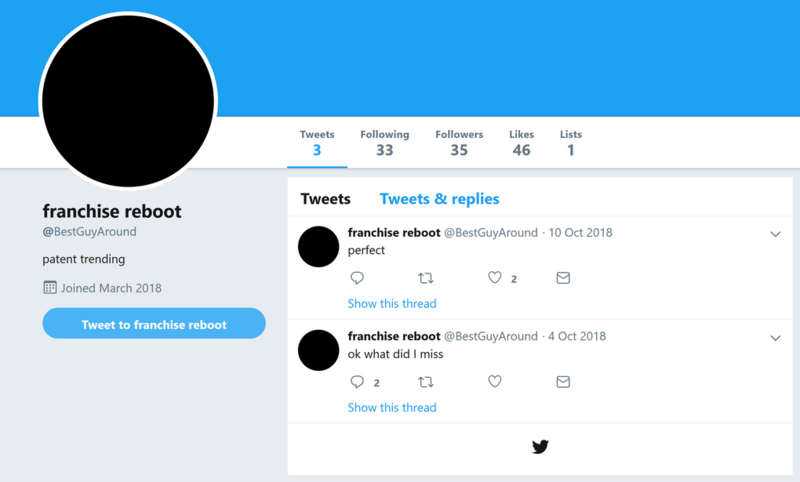 The @BestGuyAround Twitter page is a shell of its previous self. But who was @BestGuyAround, and where exactly did he go? Did he burn his wallet, cancel his Wi-Fi and walk barefoot into the wilderness? Did he leave the Earth entirely, boarding a rocket set for the sun? “He burned too bright for this world,” Kelly lamented in a phone interview with The Times last week. The answers are out there (just not on social media). Without warning, @BestGuyAround left a bizarre and creative online community — an avalanche — behind. How might one define the identity — the soul — of Seahawks Twitter? “I think it is a little bit unique,” Kimes said. “Every fan base has a different social-media identity. But they all have their obsessions and quirks and tendencies. Seahawks Twitter, for example, is a community that trades Carroll GIFs like they’re currency — GIFS of the head coach laughing maniacally on the sideline or wearing a superimposed top hat and cane, a la Rich Uncle Pennybags in Monopoly. It’s a community that considers a photo of former running back Christine Michael wearing an American flag jumpsuit to be its personal Mona Lisa. It’s a community that pokes fun at general manager John Schneider when he lounges in a player’s locker, and has no idea what to make of offensive coordinator Brian Schottenheimer. “I do think it’s a coping mechanism, I guess you can say,” said Josh Cashman, better known as Seahawks Twitter standout @CableThanos_. “I hate to admit it because I advocate for him, but no one wanted Brian Schottenheimer when he was hired. Everyone was mad. But now we lift him up into this Godlike status. Unless you like Andrew Luck. Likewise, Panthers linebacker Luke Kuechly was selected 38 picks ahead of Seahawks linebacker Bobby Wagner in that same 2012 NFL draft. “Luke Kuechly is amazing, but Seahawks Twitter is contractually obligated to remind you that Bobby Wagner is better than him,” Kimes confirmed. By extension, Seahawks Twitter is contractually obligated to remind you that their team is better than yours. And what’s the most effective way to do that? In the simplest possible terms, DVOA — Defense-adjusted Value Over Average — is an advanced statistic created by FootballOutsiders.com that attempts to gauge a team’s efficiency by breaking down every play and comparing a team’s performance to the league average. DVOA said the Legion of Boom-era Seahawks were elite, and Seahawks Twitter has yet to let anyone forget it. Sure, like its team, Seahawks Twitter has a chip on its collective shoulder the size of Lake Washington. But a couple inches to the left, there’s also an unexpected amount of heart. Kimes — who grew up attending Seahawks games with her father — has a similar story to tell. “I like that (Seahawks Twitter) is largely pretty positive,” said Kimes, who worked at Fortune Magazine and Bloomberg before joining ESPN in 2014 and owns a custom-made DVOA jersey. “As someone who has a lot of incredibly negative things sent her way all day on the internet, it is a community that really, for the most part, keeps things pretty light, even when the team is playing badly. On the internet, of all places, Kimes, Weiner and so many more found a community of kindred spirits — a Seahawks-specific island of misfit toys. They found a tiny slice of Seattle in Twitter’s nooks and crannies. They found @BestGuyAround, whoever the heck that is. They found handles like @hawkblogger, @EvanonHB, @NathanE11, @DavisHsuSeattle, @30AcreFortress, @JacsonBevens, @zjwhitman, @Camorooni, @russingmatters and @hawknado, to name a few. They found a common language developed through years of wins and losses, of Carroll GIFS and flow charts galore. One way or another, they all found Seahawks Twitter. About a year and a half ago, @CableThanos_ did, too. @CableThanos_ is a 23-year-old Everett native and full-time student at Western Washington University. Josh Cashman is the man. That’s how it started. Weekly post-win hype videos came next, with each going progressively more viral. Then Wilson chimed in, voicing his approval of @CableThanos_ and specifically requesting a video to score the team more Pro Bowl votes. “I haven’t fully processed it, because it didn’t seem real at the time and still doesn’t seem real now,” Cashman said of Wilson’s public endorsement. His most popular hype video, published on Dec. 24, has 519,000 views (and counting). In the span of a couple months, more than 14,000 people have followed his Twitter page. In sending a joke to 15 friends, Cashman accidentally acquired a kind of unintended social media celebrity. In the Seahawks Twitter world, he’s famous. And hardly anyone knows his name. “It is pretty weird,” said Cashman, who also creates content for HawkBlogger.com. “It just feels like Seahawks Twitter is so small. When I’m on there I recognize all the people on there, and I have specific people I always interact with. Capturing the essence of Cashman’s videos is a special kind of challenge. It’s as if he throws every available Seahawks joke or reference in a blender, leaves the top off and lets ‘er rip. Once a week, Cashman produces his own personal Jackson Pollock painting, chaotically splashing colors — highlights, memes, songs, movie references, you name it — across a blank white canvas. It takes him three to four hours, on average, and he emerges with a Seahawks Twitter fever dream. “My videos are thrown together and made to be as insane as possible,” Cashman said. Once, it was @BestGuyAround. Now, it’s @CableThanos_. Once, it was Marshawn Lynch. Now, it’s Chris Carson. The names change. The jokes evolve. But, like the 10-6 team it obsesses over, Seahawks Twitter survives and thrives. “When I was trying to picture what Seahawks Twitter was … to me, it represents this strange paradox where, if you’re a part of it, it will absolutely make you dumber, but at the same time it will 100 percent make you smarter,” Kelly said with a laugh.